Cold forming hypodermic cannula hubs rather than machining them could save time and costs. Image courtesy of Sussex Wire Inc.
Technavio predicts the global medical device manufacturing outsourcing market to grow at a CAGR of almost 12% during the period 2018-2022. Medical device outsource firms and contract manufacturers can expect increased demand as OEMs press to reduce their production costs. This may be the case particularly for high-volume, low-cost consumables such as endoscopes and surgical instrumentation. These outsourcing firms themselves will be under increasing pressure to provide reliable, low-cost solutions to their customers while ensuring their own health and prosperity. This means finding alternative sources for traditional products that deliver equal or better performance at lower costs will be a main driver in their success. Screw machining is one resource used extensively to support medical product manufacturing with high-quality, repeatable, tight-tolerance components. Additive manufacturing such as MIM (metal injection molding) is another resource being tasked for increasing contributions. One largely overlooked resource, however, is cold forming (or forging), a technique of component manufacturing achieved by the application of force with a punch to a metal blank staged in a die. This method of forming is achieved by force alone, forgoing the application of additional heat or cutting and shearing. This article covers the economic, strength, yield, and speed-to-market advantages of cold-formed components, especially compared with the capabilities of screw machining. The objective will be to provide potential new product design (NPD) engineers in outsource manufacturing environments an objective comparison from which to make informed decisions on micro-miniature component sourcing. NPD engineers rely heavily on design and manufacturing techniques learned through education, repeated application, and empirical success. Many alternate techniques are often approached with caution, particularly in medical and healthcare product applications where a known solution is proven and approved. In spite of its relatively low visibility, cold forming is a time-tested manufacturing technique that is not well understood. It therefore is not being utilized fully to increase yield, reduce cost and waste, and improve quality. Cold forming is not a new technology for manufacturing micro-precision components, yet it is still not well known or understood because of a widespread lack of related course work in engineering schools. NPD engineers are well advised to explore cold forming’s strengths and limitations early in the design process—or at an appropriate project review stage—and to engage in a consultative relationship with the component design and manufacturing firm to collaborate on modifications that may well improve the component’s strength and facilitate its manufacturability, while at the same time, providing the lowest-cost option available. All too often, by the time a micro/miniature part geometry is fixed by the NPD engineer, the opportunity for making improvements has passed. Even though these parts might play a small role in the greater project, their designs can be streamlined to meet all the designer’s objectives if known ahead. In other words, trade-offs can sometimes be made on non-critical dimensions and tolerances in the cold formed part in order to meet functional specifications, especially if the designer and component manufacturer are working together before the final part design is approved. In fact, this collaborative approach works for any manufacturing technique, not just cold heading or roll forming, and can often result in consolidation of multiple components in a single piece, saving even more time and cost. As stated earlier, cold forming involves the application of force with a punch to a metal blank staged in a die, and then, if necessary, some additional cold-forming secondary operations. The force exceeds the alloy’s elastic limit, causing plastic flow until the metal blank assumes the shape bound by the punch and the die. Consequently, cold forming does not re-anneal or mechanically damage the material’s original metallurgical grain structure like other processes can. In fact, it has the opposite effect: it strengthens the part. Following are the principal advantages of cold forming for medical outsource professionals. Lower Cost. 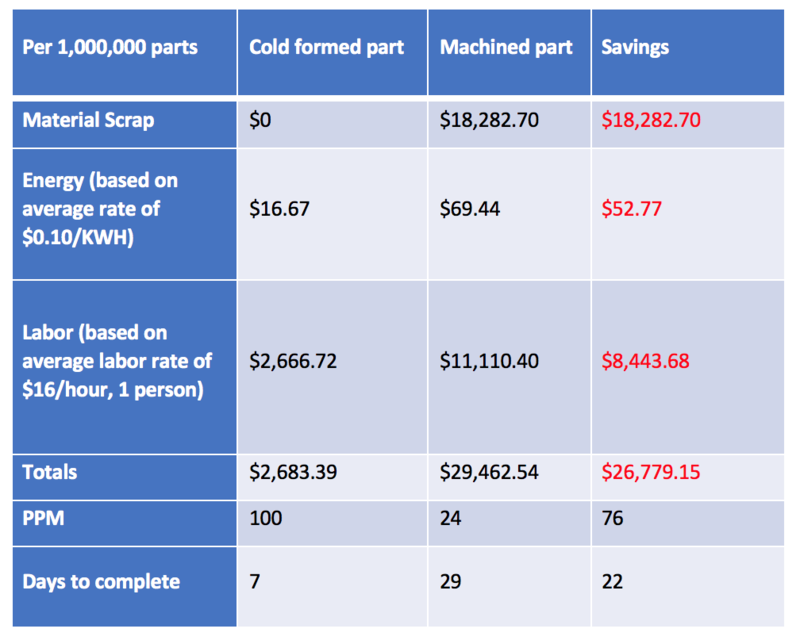 The per-piece cost of cold-formed parts is often an order of magnitude less than that of parts made by screw machining. This is due largely by virtue of the significantly higher throughput capabilities of cold-heading machinery, at 90-300 ppm versus 5-30 ppm (typical) for screw machining. This results in a much lower application of overhead to each part than for other processes. Another factor that contributes to cost savings is the virtual elimination of scrap and its associated cost for recycling material as well as lubricating oil. Cold forming is a net or near-net shape process that compresses material rather than removing it. 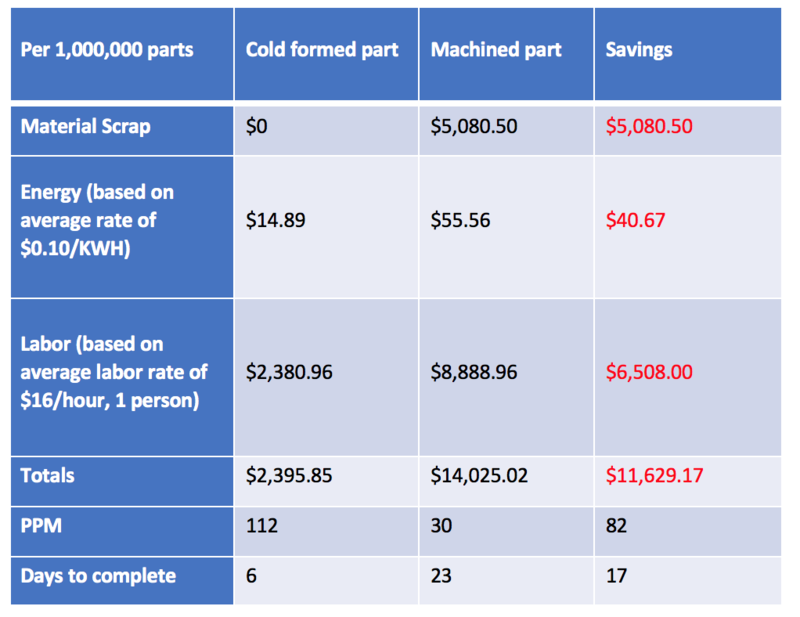 Eliminating scrap reduces energy, labor, and recycling costs. Consider this example below (refering to the above image of the hypodermic cannula hubs used in the veterinary business) that compares the cost savings of manufacturing hypodermic cannulas. Reliable Supply. Because of the high throughput capabilities of cold-heading machines, on the order of 4:1 (or greater) versus screw machining, there is seldom an issue with back orders or late deliveries. Cold-forming machines run 24/7 with one operator managing multiple stations, repeating the same part over and over with reliable consistency. A rigorous quality program ensures compliance from first part approval through the multi-millionth iteration, and just-in-time scheduling from cold-forming manufacturers ensures medical outsource buyers never have to worry about meeting delivery requirements. 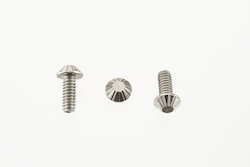 The below example of medical insert fasteners illustrates the savings of 17 days to make 1,000,000 parts by cold forming, which can be done in 6 days versus 23 for screw machining. And again, the cost savings on this quantity is a tidy $11,500. Cleanliness. The fact that cold forming uses much less lubricating oil for part formation than screw machining requires for material removal makes it easier to clean. Additionally, further cold-forming processes beyond simple heading, such as thread rolling, knurling, piercing, etc., also require very little oil, and deburring is generally not necessary. In many cases, if plating or other finishing operations are required, parts seldom need additional cleaning. The elimination of extra cleaning processes also means that cold forming is an eco-friendly process. Improved Strength. Cold forming is a process that compresses material rather than removing it. So instead of weakening the part as screw machining does, cold forming strengthens it. This can be a major consideration in medical/healthcare consumables that require durability or added dexterity from part integrity. 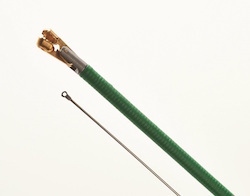 An example of such an application is this wire loop for an endoscopy forceps (below). The loop was cold formed on the end of a single-strand wire, providing a stronger and less spongy tactical experience for the doctor, resulting in greater facility for the physician and improved patient outcomes. Medical outsource professionals can benefit from exploring the capabilities of cold forming in their next project or on any appropriate part under review. Timothy Kardish is president and CEO of Sussex Wire Inc. (Easton PA). Prior to joining Sussex Wire, Kardish held CEO and general manager appointments at Leica Microsystems, McKesson, X-Rite, and Labsphere and private equity-backed technology-driven manufacturing companies. Kardish earned a Bachelor of Science degree with a dual major in Information Systems and Marketing from the Erivan K. Haub School of Business at St. Joseph’s University.